I have not had a chance to participate in one of my favorite virtual cooking events in a very long time; the MacTweets Macaron challenge, which is hosted by the lovely Jamie and Deeba. When I saw that their December challenge was not due until the 25th of December, I knew I had time and it worked out as I was planning on making macarons for our clients. Killed two birds with one giant macaron. This festive recipe for Spicy Hot Chocolate Macarons will not kill any birds, instead, it will put smiles on many faces! Every year we put together homemade goodies for our very best clients. Macarons always make the list as they are elegant and well, just perfect for a holiday treat. The problem with making macarons is that I start to get a bit crazy as I am making them; thinking of all the flavors I could add to the package. For instance, last year I could not stop at just one, instead, I had three different flavors: Eggnog, Ancho Chili and Chartreuse. This year I decided to focus on one flavor and to make it perfect. It just so happened to fall perfectly into the MacTweets challenge of Savory Sweet. I used my fail-proof macaron recipe and added Scharffenberger unsweetened bittersweet chocolate that I spiced up with some chipotle chili powder. Then I made homemade vanilla bean marshmallow fluff; which was heavenly and I had to control myself from eating it all with a wooden spoon. If you do not want to make the fluff, then use store-bought, which is just as good. 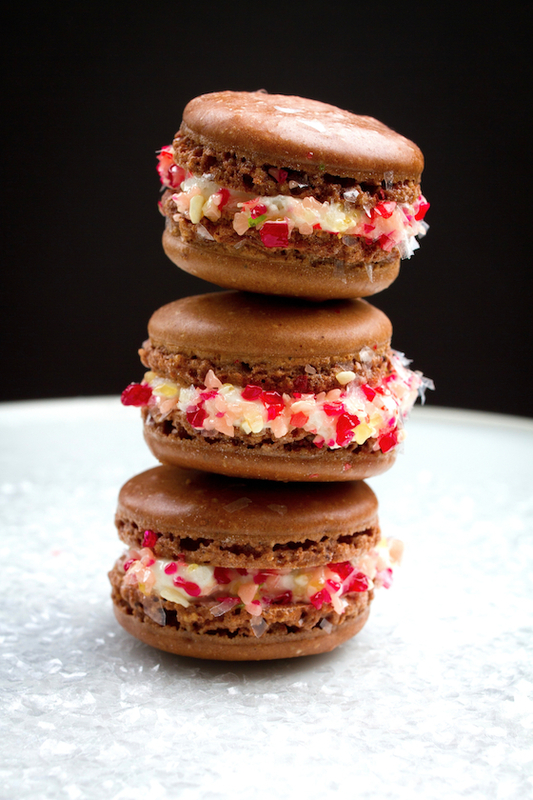 I pulled together my spicy hot chocolate macaron with a dusting of crushed candy canes. It was like a steamy mug of spicy but sweet hot chocolate on a cold afternoon. All that was missing was the crackling fireplace. Fit a pastry bag with a number 806 tip, then fill with 1/4 of the macaroon batter. Let the macarons dry at room temperature for 30 minutes (Aran suggests 20, I lost track of time). Lightly spread about a teaspoon of fluff on one side of a macaroon, then top with another cookie. Let a little squeeze out the sides, then roll in the crushed candy cane. 14 Responses to "Spicy Hot Chocolate Macarons"
Love these macarons! I hope you have a wonderful holiday! These are absolutely inspired and inspiring Denise! Love the flavours and they are so pretty! WOW. Wish I was having one for breakfast! Wishing you and Lenny the best holidays full of delicious food and drinks and love and laughter! Such fun and interesting flavors to put together. I wish you a joyous holiday. These are so beautiful. I wanted to take a bite of the picture. Thanks for the lovely comments on these delicious little hot chocolate bites. They really are heavenly and I wish we had a box of them with us in Boston right now! Hope you all had an amazing holiday season (so far)! These look and sound fantastic - can't wait to try them! These are STUNNING Denise, and bursting with holiday spirit. It's wonderful to have you back joining us at MacTweets. Sorry I'm late stopping by; do forgive me. I LOVE what you did with the flavours. Your photograph is just leaping off the screen!! Hope you have a wonderful New Year my friend! Happy 2011!! These Spicy Hot Chocolate mamas are perfect for the Winter. I wish I could be one of your clients to receive these lovelies.